Human life is mostly governed by beliefs. We have beliefs guiding every aspect of our life and while some are true, a few have no connection with the real world. They have been with us from years and we are following them blindly. Such beliefs are defined in the dictionary as 'Myth'. They are generally passed on to generations ahead and stay in existence until they are busted or replaced by real facts. And these myths can linger onto anything around; be it your health, religion, your way of parenting etc. The Fact: This is not compulsory rule. You can even give the baby a cereal made with the ground rice. It's quite rich in iron and is also easy to digest. The Fact: Bathing the baby under minor cold or fever does no harm. But you should protect the baby from cold wind. In case of high fever, a sponge bath is ideal. The Fact: These natural products are that mild, especially for a baby's skin. Besan can even cause skin dryness and rashes on your baby's skin. It's better to stick with mild baby products. 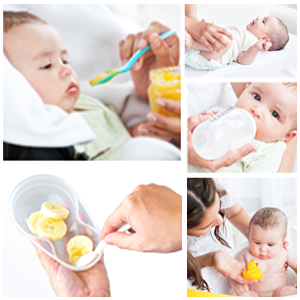 The Fact: Teething may cause a fever if, baby is not given clean and sterilize teethers. Fever caused due to teething will never cause fever more then 101 degrees. So don't blame your child's extreme fever on teething. It would be better to get him diagnosed. The Fact : Hiccups are absolutely normal. For the first few months, the baby should only be breast fed. No extra water is required. The Fact: Babies can't blow their nose like us. Sneezing apparently there way of clearing the nose. Don't mistake it for a fever unless it occurs frequently in a day. The Fact: Babies are no more advised to be given a dose of aspirin in case of fever. It has been known to develop grave medical issues. The Fact: Until and unless the child has any sort of allergy from milk, it can never affect the respiratory tract mucus in case of a cold. Thus, giving milk to the child when he has cold is absolutely safe. The Fact: It can instead make the child sicker. Alcohol tends to evaporate very fast and can bring down chills because of which body increases the temperature to higher level. The Fact: Health experts totally disagree of it. Kids can be easily vaccinated during cold or fever. Precaution has to be taken only if it's a severe one. Myth 11: Walkers teach the baby to walk sooner. The Fact: Walkers are more likely to delay the walking process as they don't activate the walking muscles in the child. Moreover, it can be dangerous for the kids. The Fact: Infrequent bowel movement is common in the breast-fed babies. It's not necessary for the child to have it every day. And it certainly not means that the child is constipated. The Fact: The fact is complete opposite of the myth. The limbs will develop faster if set loose and free for making movements. The Fact: Talking in 'Baby Language' can hamper your child's language skills. Always use the best of vocabulary and clear language so that the child learns the correct basics. The Fact: Brain happens to be the last organ to develop fully. Most brain development takes place during the first three years of life. 75% of it is finalized by age seven. If you have been following any of these myths, it's time to mend the way. Stay connected with the real facts and knowledge so that no myth can disturb your life!